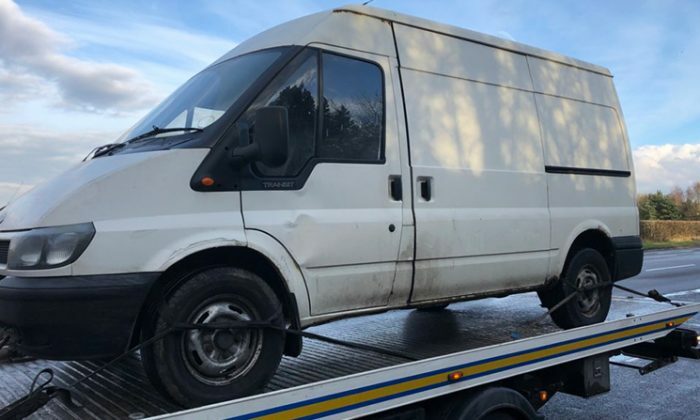 Officers with the Central Motorway Police Group (CMPG) stopped a driver on the M6 motorway in Staffordshire, England on March 15. The van was stopped in traffic near the town of Stone, Metro reported. The driver was unable to produce a driver’s license. He also did not have proof of insurance. Nor did he have a Ministry of Transport inspection certificate. He had no tax certificate. No license, no insurance, no inspections certificate, to tax certificate—it is hard to imagine how a driver could be any more illegal. But this driver found a way. His van had no brakes. The driver had been cruising down the highway relying entirely on the emergency brake to slow the vehicle. CMPG officers opted not to arrest the driver, just ticketing him for the offences. They did, however, seize his van. The officers took a photo of the van and posted it on Twitter. “Deep breath for this one,” the tweet started. “No tax, no insurance, no MOT, no licence and no brakes, yes that’s right no brakes! “No brakes at all, they were driving along the motorway using the handbrake to slow down.